Harrington's (N)ER enhanced features three phase electric chain hoists are equipped with the latest technology in the market today. All models include a low headroom, lightweight body with a fan-cooled motor, standard thermal motor protection and a count hour meter for preventive maintenance. A secondary mechanical load brake is an additional features on ER models only. 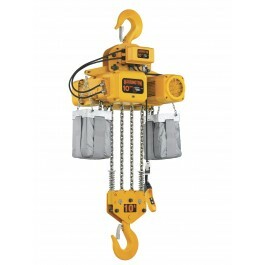 All standard models are UL listed to UL 1340 "Standard for Hoists"